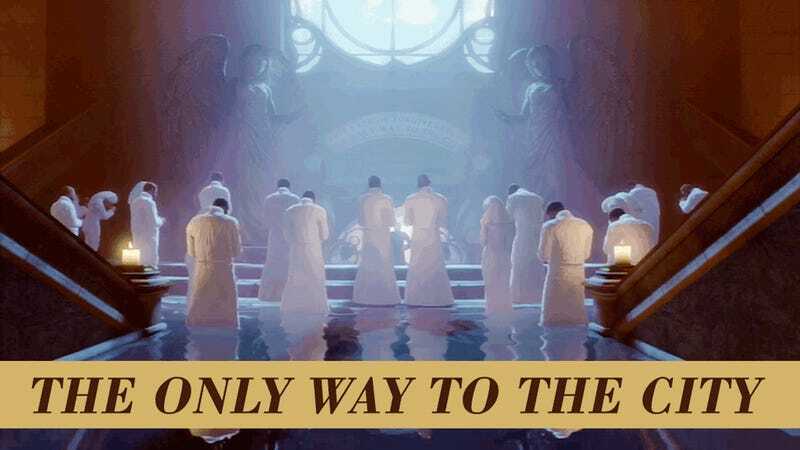 What if I told you that Bioshock Infinite was the mostly deeply Christian game I’ve played in recent memory? Because it was. And despite the patience I choose to extend toward Breen Malmberg, the man who returned the game, claiming that it would have forced him to commit “extreme blasphemy,” I cannot let his be the only voice Christian voice commenting on the title. Some Don&apos;t Like BioShock&apos;s Forced Baptism. Enough To Ask For A Refund. Of course, the game can be read on so many different levels. It is as complex or as simple as you want it to be. You can read it as a failure in its attempt to comment on game violence through violence. You can read it as a foolishly simplistic attempt at documenting the history of bigotry and racism. You can even read it as a gigantic, apathetic “MEH”; insisting that no ideological group has ever done anybody a damn lick of good. It is, of course, all of these things—these shortcomings—and more. But in a more radical fashion, I want to share with you the myriad ways that this violent, AAA shoot-em-up has perfectly captured the subversive spiritual energy that first gave bloom to Christianity, the religion in which I was raised. It’s not even a question of digging deeply. The game threw it in your face before you even picked up the controller. Spoilers for BioShock Infinite follow. I mean honestly, a game that is bent on exposing the failures of institutional religion? This criticism may strike at the heart of American, cultural Christianity but it actually lies at the heart of true Christianity. There was no fiercer critic of decrepit religion than Jesus himself. As if oft pointed out, he was not killed by the sinners, he was killed by the religious leaders of his day. So in our age, the customs that bring life in one generation are always decaying by the next, and we must not grow so fearful of losing the baby that we neglect to throw out the bathwater. Complicit in this criticism is a man (and yes, Mr. Malmberg, Booker Dewitt is his own man, though we are more like him than we may care to admit), wracked with guilt over his past misdeeds, who cannot find any way to atone for his sins but by more violence. This feedback loop where brokenness begets brokenness? In Christianity we call it sin. Not merely deeds, but a state of separation; and not just from “God,” but from the meaning of life itself. "This feedback loop where brokenness begets brokenness? In Christianity we call it sin." Booker’s meaning of life ends up being a girl, Anna or Elizabeth, whatever you’d like to call her. Elizabeth enters the story as a Macguffin, (“Bring us the X”) but as we grow to know her, she changes the story, in more ways than one. He loves her. Only, he doesn’t know why. Doesn’t yet know she is his daughter. And here, love is portrayed not as Hollywood romance, but as mystery. Love as terror. Christianity never painted the loving God as a tame God. He was a mystery beyond any of our conceptualization. One Biblical writer helped us to see somewhat clearer when he penned: “No one has ever seen God, but when we love one another, his love is seen through us.” Although loving a concept of God is easy enough for most Christians today, the true prompt of our religion is a commitment to love him by loving the most terrifying among us. Terrifying not because we don’t understand each other, but because we do. Finally, integral to the story is the critique of symbolic baptism. Not only, the story insists, is it entirely ineffectual at actually wiping away past guilt, it actually redirects the negative energy into something far more terrifying. Sans baptism, Booker is a drunk. With it, he becomes a monster. "Sans baptism, Booker is a drunk. With it, he becomes a monster." This is entirely reasonable. A splashing of water was never going to bring redemption. So why is the imagery so powerful? Because the real meaning of baptism, even in Christianity, is far, far darker. Remember Inception? Dom Cobb, chief inceptor, leads a rag-tag crew into the mind of a wealthy businessman, constructing a dense and elaborate plot, leading the subject on a wild-goose-chase to create a single moment, and plant a single thought. Bioshock Infinite is ambitious in ways that make talking about the game a daunting task. Should we start with the themes of religion? Racism? Populism? Oh, not enough? What about quantum physics, time travel, and alternate realities? Some have suggested that by the end of the game, the story has begun to tear itself apart. They’re so right. But what if it was not about constructing a watertight plot at all? What if the entire game was constructed in order to bring us to a single moment? What would we find in that moment? In fiction, the villian exists so that we can project our own internal conflicts onto an external source. We do not know how to deal with our own issues, but if we can witness the defeat of a villain we can avoid our interior pain, angst, and confusion a little while longer. This is nowhere more the case than in video games. Not only is the villain stopped, he is stopped by us, the hero. What would happen if we realized that we were both the hero and the villain? How would we then be stopped? At the heart of Christianity is the steadfast insistence that we are all beautiful, but we are so, so far from perfect. We all are, and can be, heroes. We all are, and can be, villains. "Baptism is actually far more bizarre than we realize. It is a symbol—get this—not of cleansing, but of drowning. It means that something in us is dying." And as it all spun out of control for thousands of years, we tell the story of how God came down to earth as a person, telling us to love one another before dying a very violent death. And we conjecture that his death had great signifance. In fact, we toy with the possibly insane notion that he actually showed and made a way for us to be free from our sin. By dying. Baptism is actually far more bizarre than we realize. It is a symbol—get this—not of cleansing, but of drowning. It means that something in us is dying. After taking us by the hand to show us the failure, not just of religion, but of any utopian vision, Ken Levine and team must now show us their version of a satisfying ending. We kill the villain, and he is us. What we find, as the last, haunting notes ring out, is a vision that far more closely resembles Christianity than many of the shadows that have falsely claimed the label in our lives. It is redemption through death. Atonement through sacrifice. And after the credits roll, we are left, as in Christianity, with merely a hint that something more lies beyond. That death is, perhaps, only the beginning. Comstock’s cult has as little to do with the heart of Christianity as hate-groups like Westboro Baptist do. Indeed, it is as far removed from the teachings of Jesus as the anti-religious comments I’m sure to receive are from the thoughtful and generous atheism I’ve witnessed in certain of my friends. "It is redemption through death. Atonement through sacrifice." My own spiritual journey has led me to believe that the mysterious universal(?) that we recklessly refer to as God is far more inclusive than I had ever fathomed, and yet, the road to redemption is a road that leads, perhaps, to a type of death. Ken Levine has, in many ways, failed to craft the perfect game, but I believe he has done something even more important, he has spoken as a prophet. As I come to these conclusions, it may very well be the result of pre-formed thought patterns; synapses in my brain, firing off in the darkness; looking for connections where there are none. Or perhaps we’re all onto something. Jordan Ekeroth is just a guy. He writes for Gamechurch.com and spends a lot of time wondering if he drinks too much coffee. Follow him on Twitter .